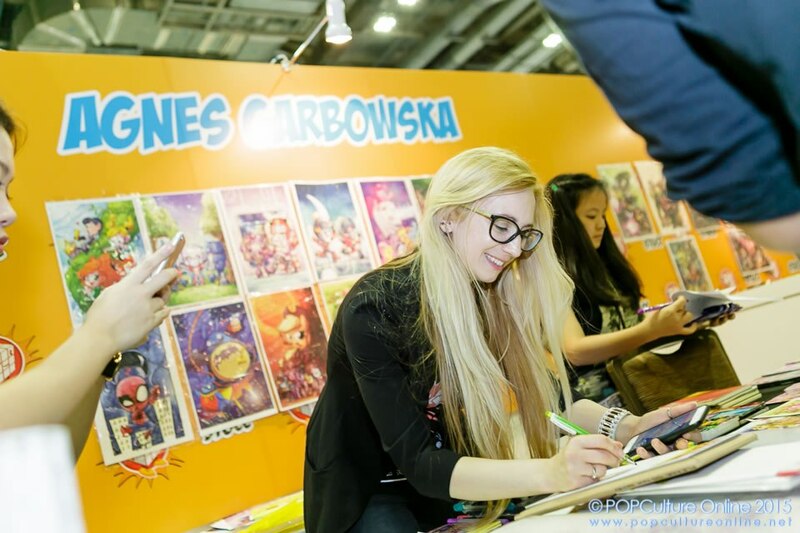 Agnes Garbowska is a Canadian based artist best known for her work on the My Little Pony: Friendship Is Magic comics for IDW, Victories for Dark Horse, Li’l Vampi for Dynamite and who could forget her amazing artwork in the Spider-Ham 25th Anniversary Special for Marvel Comics. Agnes had also done the covers for numerous IDW titles such as the comic book adaptations of Powerpuff Girls, Samurai Jack and Dexter’s Laboratory. This talented Canadian bombshell has illustrated covers for Dynamite Entertainment’s Li’l series, heck she had even done covers for Sonic The Hedgehog and Unity giving them the unique Agnes touch. It’s safe to say; Agnes’s work is so cute, it’s borderline diabetic. In town for STGCC 2015, Kenny Chen KangYi talks to Agnes about overcoming the writer’s block, the hardest part in the comics industry and about the My Little Pony series. You’re known for your cutesy art style, who or what actually inspired it? Oh my gosh! I think there isn’t just one inspiration. Style is something you develop over time by being influenced by your surroundings and artist. Well, I like Alphonse Mucha, Chris Bachalo and Jim Lee; they’re nothing like my style but they got me drawing. I also love Skottie Young’s work and Jill Thompson. They are all creators that don’t really influence the way my style looks but influence me to try new thing and experiment and I think that’s where my style really developed. How did you get involved in Art in general and were you a fan of the original My Little Pony series? A: Well, I was a fan of the My Little Pony series since the 80s; I was actually a fan of the original My Little Pony. I grew up playing with the original, very weird looking but awesome ponies. I was just obsessed with the movies, I loved everything MLP growing up so now working on MLP is kinda surreal in a way because I’m working on something I loved when I was so young and now I’m working on the newer version. I actually didn’t get into the newer version until the comics were out because I thought it (MLP TV Series) was just a kids show but then I decided to give it a shot because so many people are telling me that the show’s good. So I started watching it and I thought “Wow! This is really good and it’s gonna have a comic………” So I thought that it’ll be something I’d love to be a part of. I submitted my web comic which I self-published to IDW and it was actually my storytelling that got me the job and not the fact that I can draw ponies. The editor went “Well, I don’t know if you can draw ponies but you can tell a story” and I had this really good chance thanks to my art rep to work on an exclusive cover and it was the job I did on this exclusive cover was really good and the editor liked it so I got hired from that point on. What do you think are the differences between doing published work verses creating your own web comic? Well in published work, you get paid *chuckles* that’s the huge difference. It’s really really nice making a living off drawings and that’s the nice thing about working on published books is that I get to do what I love and enjoy doing, and I get paid for it! Which is really good because it pays my bills and I really love it. The huge difference is that with my Web comic, I have full control; I’m the creator, I’m the writer, I’m the colorist so I do everything. When you work on published stuff, you work in a team, I have my editor, I work with writers; I get a script so I work off someone else work and that’s the huge difference, I’m working someone else’s idea and bringing it to life and bringing their vision to life whereas in a web comic I’m bringing my own vision to life and I’m my own editor so I’ve to be very critical of myself and I have to critique myself. When you get published, you’re getting critiques from your editor and writers so you have to make sure you’re doing good work to please them. That way you get rehired because you hit those deadlines, you do a good job and you answer to a boss which is pretty cool because I love answering to my editors which is great because all of my editors have been amazing so far. Well….Deadlines *chuckles* I’m not even joking. When I get the worst artist block, I just kinda go “Well, if I can’t get over this I’m not gonna hit my deadline” and that is a very high motivator because the fear of missing a deadline is pretty bad, because that missed deadline might cost you the next project but what I recommend to people which is something I do, if I get stuck on a page, I move on to the next page so instead of stopping work all together, I’ll just move on to something else or at least a different part of it; for example if I get really bored of drawing, I’ll see if I have anything to ink and I’ll start inking just to try and get over that(artist block) but continue the process. If I’m really really stuck, I’ll read a comic, play video games for an hour; just something to reset myself, I’d go walk the dog and clear my mind and I get back into it after that. But deadline are usually the best motivator because if I miss it, there’s gonna be trouble. The editors are not gonna be happy and I like making my editors happy. You’re most prolific for your work on the My Little Pony comic series but if you’re able to get to work on other series, what would it be? 2 things! One, I’d love to draw Rocket Raccoon because I’ve a little bit of a Rocket Raccoon obsession, I think he sooooo cute! Or two, I would love to work on the Tiny Titans which is super sweet and I wanna do the next level all age version that has the mini Justice League Adventures. I think it would be amazingly fun to work on. If you can assemble a dream team of Artist, Colorist, Inkers, Writers and Pencillers, who would it be and why? If I could work with someone… I’d love to work with Gail Simone I think she is a brilliant writer and the both of us could do some fun stuff together. For colorist…oh my gosh, I’m just so used to coloring myself but if Alex Sinclair can color for me, he does crazy work for DC comics and if you ever seen his watercolor where he paints zoo animals, they’re absolutely stunning so if I could hire anyone and had the budget to I would go to Alex and go “Hey Alex! Wanna color my stuff? !” I don’t even have favorite artists because they’re so rad but just give me someone like Joe Madureira, Skottie Young or Dustin Nguyen. Just make Gail Simone write everything because I love her writing. I could hire Bobby Curnow whose my editor on My Little Ponies is just amazing so I say just give Bobby all the work and stuff Alex Sinclair on that. That’ll be pretty cool, that’ll be a very random combination but I think it’ll be neat. You’ve been doing water color sketches at your booth; does the advent and adoption of the digital medium help you as an artist? It really depends on the process; I do work digitally because when it comes to my published work, all my layouts and pencils are done digitally just because it’s faster for me but I love the feel of paper and pen on paper so I don’t think I’ll ever ink digitally, I think I’ll be a traditional inker and I do my tones which is the shadows usually in watercolor for my books even though I’m starting move towards more digital coloring especially when you’re working on a kids book because you want those colors to be very bright but I think no matter if you work digital or traditional you’ve got to have your traditional fundamentals, you have to understand color theory, you have to understand painting and even how different ink reacts to different paper because this knowledge is something you apply to your computer if you don’t have a sense of color theory, it’ll show the moment you go on to digital coloring so I tell everyone, it doesn’t matter if you’re digital or traditional painter, you have to have your fundamentals. So anytime someone tells me that they love digital, I’ll ask them if they ever paint; if they don’t, I’ll advise them to try traditional paint just because you have to understand that a lot of the techniques used traditionally still apply to the digital medium. What’s the hardest part of being in the comic industry? Deadlines…. *chuckles* I know this is the 2nd time you’ve heard me say that but it really is the hardest thing because it is stressful. I don’t like saying No and I’m really bad at saying no so if an editor tells me “Hey, I have a 22 page book but you have a month to do it”, I’ll just agree and do it but….. I don’t leave the house or walk the dog for an entire month. Deadlines are very very stressful but you have to do them and I think it’s a very high motivator to get work done because I think a lot of people are not self-motivated whereas if you’re stuck with a deadline even when you’re in school, even when you don’t want to do the work you know you have that deadline, you have to do it. It does get really stressful and the other thing that’s really hard is that, sometimes you get stuck in a bubble where you stop growing as an artist where I think you should always test yourself, you should always draw the thing that’s difficult for you so I do a lot of sample work for companies to try and get them other properties where sometimes I agree to a sample and it’s outside of my style but I’m a mimic artist so I’m able to pick up a style very quickly. So when I picked up the cover for Sonic the Hedgehog, the first time I drew sonic the hedgehog, it wasn’t a good sonic, I only had 3 days to do the samples and I wasn’t 100% sure but I knew if I pushed myself I can do it and by the 3rd day I could draw him a lot easier than I did 2 days ago because I was pushing myself. It was quite difficult but I don’t want to be stuck in that bubble and be a one trick pony (Pun intended). I can totally work on anything assigned to me but I don’t think I’ll never work on mainstream comics just because I don’t prefer to draw in that style. However, that’s where I started off (mainstream comics) but I enjoy drawing for the all age market so I think I wanna stay within that genre but I wanna make sure that I keep going. What would you be doing if you did not do comics? A: Definitely not animating because I realize I really hate animating *chuckles*, I know it’ll be something in the creative industry. I thought of going into film for a while so I actually got accepted into film school so I know it would be something either film related, storyboards, illustration of some sort because I’m actually good at it and not good at anything else. I’m used to be really good at math and computer sciences but I didn’t enjoy it very much, I was just really good at picking up programming and coding even though it’s really really boring. My mom was a computer programmer and she encouraged me to join her profession, I just replied “No…no I wanna draw”. What do you think is the most important aspect of visual story telling? It’s a lot of things, it’s your pacing, it’s your composition, your camera’s placement. You have to think of comics like film storyboard, each panel has to count. That’s why if you ever looked at my comics, you’ll notice that my panels are very simple, I like to tell a very simple story, let each panel speak for itself and it’ll be easy to read. “Which way is the character looking?” because I want to move your eye to the next panel, “how’s the character standing?” And “what angle to use?” I think that’s very important but in comics it’s not just that one shot, it’s how all the shots work together because you wanna make sure that fan want to turn to the next page and you want to motive them to do that. So I really think of comics just like a freeze frame of movies where I wanna make sure you’re entertained, you feel the emotion and you really enjoy the story. Have you ever thought of bringing your work to another medium e.g TV, Video Games etc ? I would love to! A company actually had the rights to Waking Up Abbey (Agnes’s own web comic) for one year, to sell it as a kids animation, it never worked out, I think that he wasn’t pitching it right. He had full control over how to pitch it so he changed the story a bit but Waking Up Abbey almost made it to a TV show. But yeah! I’d love to bring my stuff over, if I could find someone to sell it and advertise it properly. I’m actually working on some stuff for Bandai but it’s just minor stuff, they’re really cool and I enjoy working for them but I’m working on their properties and their characters but if any of my personal properties would get anything else, I think it’ll be amazing but I think it’ll just be a very difficult process to go through.